Ben Affleck may be adding another Oscar to his mantel this year, but this time for direction. In 1998, Affleck won the Oscar for Best Original Screenplay for “Good Will Hunting.” In his third feature, Affleck steps out of his Boston film comfort zone and takes audiences across the globe in “Argo.” This politically charged edge of your seat thriller is based on the declassified true story about a dangerous rescue during the 1979-1981 Iran hostage crisis. In this crisp, compelling drama laced with the perfect dose of humor, audiences go behind the walls of the CIA (yes, the actual CIA headquarters) and experience the contrasting, exotic lands of Iran and the inner workings of Hollywood. Although Affleck’s first two directing efforts, “Gone Baby Gone” (2007) and “The Town” (2010), are nothing to scoff at, “Argo” proves that the third time’s a charm. Taking place over three decades ago, “Argo” is authentic, intense and exceptionally intelligent. Whether it be the classic cars, shaggy hair, old Burbank Studio water tower or vintage Beverly Hilton Hotel, the outstanding period detail is impossible to ignore. Affleck’s work as both director and star are top notch. In fact, it may be one of his strongest performances yet. Despite his cool, calm, and confidant demeanor, audiences’ hearts will be racing from start to finish as they quickly become attached to the characters. 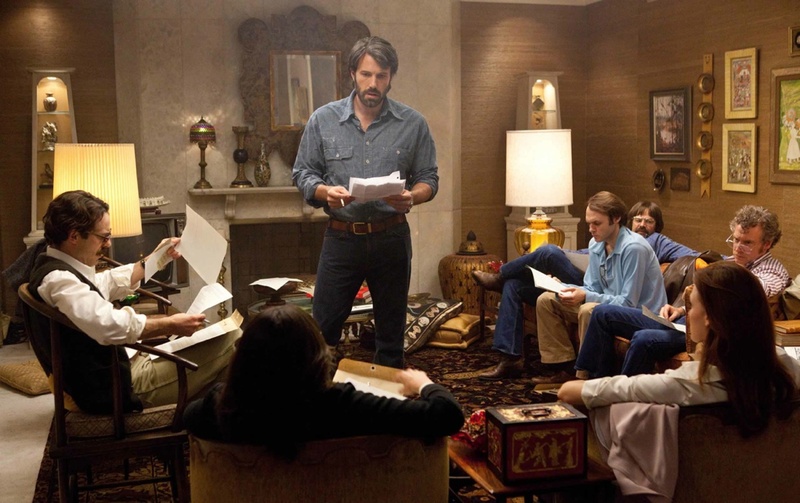 “Argo” includes a large, all-star cast with 120 speaking parts. Cast members include John Goodman, Tate Donovan, Clea DuVall and Kyle Chandler among others. The soundtrack, script, stars and sets gel effectively in the creation of this intense nail-biter. The film begins in Tehran during the takeover of the U.S. embassy that leads to 52 Americans spending 444 days in internment. During the invasion, six American diplomats escape before becoming hostages. Although safe in hiding at the Canadian Embassy, their absence won’t go unnoticed for long. Plus, the Canadian ambassadors, Ken and Pat Taylor (Victor Garber, “Charlie’s Angels” 2011 and Page Leong, “The Bourne Legacy” 2012), would be killed for harboring the enemy. These wanted six men and women must escape. Their chances of being captured and killed increase with each passing day. The CIA needs a plan…yesterday. During the Q&A session following the screening, Affleck revealed some of the secrets behind the film, which was originally titled, “Lords of Light.” Affleck said he liked the script because it had a lot of meat for the other actors. He wanted to “attract them to the script and let it play out as it probably would in real life,” avoiding the cliché. The film impacted international relations as the Canadian Embassy in Iran closed the same day the movie premiered in Toronto. Canada also suspended their diplomatic relations with Iran. The real hostages from the crisis were thrilled to meet with their respective actors and tell their story. When the Iran hostage crisis began, Affleck was just seven years old, the same age as Mendez’s son in the film. Affleck relied on magazines, videos, and newspapers to validate his re-creation of the era. “Argo” was filmed in Los Angeles, Istanbul, and Washington D.C.
Mendez’s courageous work on this top-secret assignment was kept under wraps until President Bill Clinton lifted the mission’s classified status in 1997. Bottom Line? One thing is for sure; “Argo” is no fake hit. A must see. Period.